Back in August, Carlo Fusco invited me to speak on his podcast about my education passions, and the things that were keeping me up at night. In the podcast, I quickly outline my concern about the gap between what I see happening in schools, and what we need to learn to thrive in 2017 and beyond in the digital economy. However, it was later in 2016 that I listened to Audrey Watters and Kin Lane in the Tech Gypsies Podcast, when they talked about each and every one of us being responsible to learn the things we must learn to make sense of the world, and to make good decisions. We need a more digitally literate society. There are so many examples of why this is true, and I will be exploring those further this week. 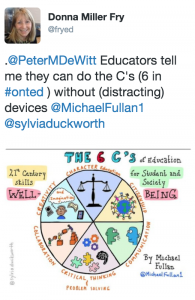 Even when we consider the thinking around 21st Century Learning, and the 6 C’s (or 4 C’s) that we so readily accept, we are missing the part where digital literacies are critical to making good decisions for ourselves and for our children. 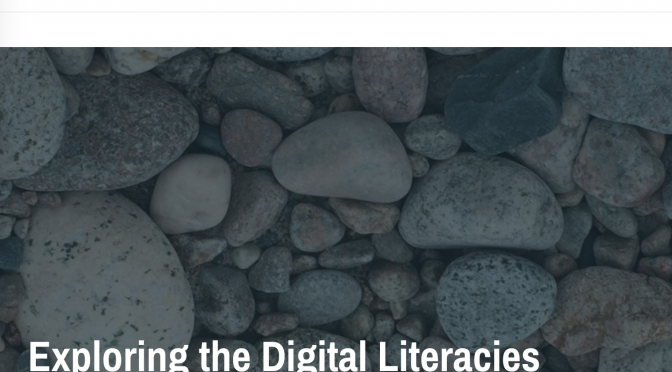 Throughout 2016, I worked to craft careful messages to influence others about the importance of digital literacies. In 2017, rather than a focus on trying to convince others that digital literacies are important, I am committed to providing an open structure where others can learn more about technology with me. I am convinced that in this world where facts are difficult to find, each and every one of us needs to find our voice and lead learning that will ensure that our connections are creating positive change in our world. This spoken word piece, written and performed by Chinaka Hodge at TEDWomen 2016, pushes all of us to find the leader inside ourselves.